First meeting of the Social Security Board, September 14, 1935. 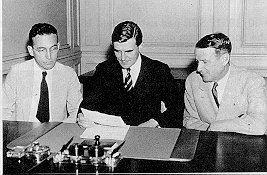 Left to right: Arthur J. Altmeyer, John G. Winant (Chairman), and Vincent M. Miles. It may only be the first draft of history, but William Galston of the Brookings Institution has written a paper entitled "Why President Bush's 2005 Social Security Initiative Failed and What It Means For the Future of the Program" and, unlike most of the recent workproduct of "think tanks" that I have read, this is a calm document. My guess is that even most on the right would have little argument with it. A lot of people have done it - used the handicapped restroom stall at work when others were available. But the bad manners usually don't cost an employer thousands of dollars. An administrative judge awarded a Social Security Administration employee who uses a wheelchair $6,500 in damages this year after nondisabled co-workers occupied the handicapped stall and caused the employee to urinate in his pants on three occasions. The agency, Administrative Judge Laurence Gallagher ruled, discriminated against the Woodlawn-based worker by not doing enough to prevent the humiliation after he complained several times and resorted to bringing a change of clothes to work. But in 16 minutes Johnson emerged, wondering what had just happened. "I could have done that exam myself," Johnson said. • Frequent allegations that doctors spent too little time with patients. Federal rules require doctors to set aside at least 30 minutes to one hour per appointment. About half of those interviewed said their exams were shorter than 20 minutes. • Former and current applicants and their attorneys who described odd behavior by doctors. Some complained of curious attire, such as a Hawaiian shirt. In another instance, an attorney said a doctor spent only minutes, discussing television shows, then dismissed his client. The number of workers receiving disability in the U.S. is growing so rapidly that these benefits are now the fastest rising component of Social Security spending - growing at nearly twice the rate of retirement benefits, according to a new analysis from the National Center for Policy Analysis (NCPA). In a separate study also released today, the NCPA says Chile's disability system costs less than half of the U.S. system - 1.8% of payroll in the U.S. versus 0.7% of payroll in Chile - and provides more generous benefits. "Older workers often have an incentive to use disability as a form of early retirement," said NCPA President John Goodman. "In Chile, the incentive is to keep working." According to the Social Security Trustees, the number of disabled beneficiaries more than doubled, from 3.9 million in 1985 to 8.4 million in 2006, whereas people receiving retirement benefits grew less than 25 percent over the same period. Annual disability expenditures grew five fold, while retirement benefits grew less than three-fold. If workers claim early retirement benefits from Social Security, the amount they receive for retirement is reduced. By contrast, a 62-year-old worker can claim disability and receive monthly benefits that are about 30 percent higher than early retirement benefits. This creates an incentive to claim disability. And, disability benefits stop if the beneficiary returns to work, therefore discouraging productive labor. Although less than 40 percent of disability applicants are initially approved, about 60 percent are approved after appeals. Since appeals are only made by the applicant, not Social Security, the number can only go up, never down, during the appeals process. Chile replaced its traditional social security system 25 years ago with a system of personal retirement accounts. Workers now put 10 percent of their wages into personal retirement accounts in pension funds of their choice and pay an additional 2.4 percent for survivors' and disability insurance and administrative fees. Depending on the number of years they have participated and the degree of their disability, Chilean workers are guaranteed to receive as much as 70 percent of their wages - a higher percentage than disabled workers in the U.S. Although workers have a lifetime to save for retirement, they can become disabled at any age. If a disabled worker's retirement account balance is insufficient to purchase an annuity that replaces a guaranteed percentage of his wages, he receives the rest from a group insurance policy purchased by the worker's pension fund. On the average, workers' own savings are projected to cover about 50 percent of the cost of their disability benefits; insurance covers the rest. Due to this reform, Chile's disability system will cost only a fourth of what it otherwise would have been, in the long run. Part of the benefit is financed by the worker's retirement account and investment earnings on the annuity premium. Since disabled workers draw on their own retirement accounts to fund their benefits, workers have less of an incentive to claim disability as a form of early retirement. Pension funds in Chile participate in the disability assessment procedure and can challenge disability determinations made by independent medical boards. Once workers in Chile are approved for permanent disability, they are still permitted to work. "The experience of Chile suggests disability costs can be contained in a way that benefits both workers and the economy," said former World Bank economist Estelle James, author of the NCPA study. "It is a model worth considering." Unfortunately, think tanks, particularly right wing think tanks are mostly polemic factories these days. What happens in Chile when you run out of the money you put in your retirement account? If the answer is that you get nothing, then Chile's disability system is not remotely comparable to the U.S. system. What this report does not say is that the U.S. Social Security disability system is among the cheapest in the world, in every sense of the word "cheap". "To say that this is unacceptable to us and to the residents of San Pedro and Wilmington who will be unfairly inconvenienced is an understatement," said U.S. Rep. Jane Harman, D-El Segundo, in a letter to Social Security Administration Commissioner Michael J. Astrue. Harman was joined by other representatives - state Assemblywoman Betty Karnette, Los Angeles County Supervisor Don Knabe and Los Angeles City Councilwoman Janice Hahn - in objecting to the closure, which they said comes a year before the agency's lease for the San Pedro office expires and flies in the face of an agreement worked out earlier to keep the office open awhile longer. The Social Security Administration has released its monthly statistical compilations for Title II and Title XVI of the Social Security Act. The ME shall maintain a satisfactory quality level of performance when reviewing disability case files. The ME’s level of performance shall be identified through the Office of Medical and Vocational Expertise (OMVE) quality assurance program and its policies and procedures. OMVE will randomly sample 1 or 2 completed work products per ME per month. The work will be reviewed by OMVE full time staff for compliance with SSA policy and procedures, completeness, and accuracy of medical assessment of severity and functional ability. Feedback documentation will be provided to the ME. The ME will have the opportunity to discuss any noted deficiency with OMVE staff and will make the agreed upon corrections to the appropriate documents. The announcement appears to cover both MEs who testify at hearings before Social Security Administrative Law Judges (ALJs) as well as those who work for Social Security's regional and central offices. I hope these quality assurance reviews do not apply now and are not intended to ever apply to MEs testifying before ALJs. The session exploded into a free-for-all after local architect Lyle Munsch of Visalia-based Canby Associates, who has been working on plans for the Social Security building since February, tried to describe the building's design and aesthetic qualities. "I don't care if Picasso paints a bucket of garbage, it's still a bucket of garbage," resident George Landis said. Representatives of the GSA and Social Security Administration were invited to the meeting but did not attend. Can someone who lives in that part of the world explain this to me? I think that the residents of most cities would welcome a Social Security office. Are they worried that poor people might visit an office in their midst? The Senate on Thursday passed and sent to President George W. Bush a temporary spending measure to keep the federal government running through November 16, giving Democrats and Republicans time to work out budget disagreements. By a nearly unanimous vote of 94-1, the Senate approved the bill that is designed to avert government shutdowns that could have begun as early as next Monday if agencies ran out of money on the first day of the new fiscal year. The legislation, which Bush is expected to sign into law, is needed because Congress failed to complete any of the 12 regular spending bills to fund government programs beginning October 1. The U.S. House of Representatives approved the temporary funds on Wednesday. David Traver on the CONNECT board is posting an e-mail that was sent to employees of the Michigan Disability Determination Service (DDS) warning that the federal fiscal year ends on September 30 and no new budget has been adopted for the next fiscal year. Michigan DDS is funded by the same budget that funds the Social Security Administration itself. Neither Michigan DDS nor Social Security can open for business next Monday without a budget. This e-mail advises Michigan DDS employees of procedures if this should happen. There is no reason for alarm about this. There is every reason to believe that Congress will pass and the President will sign a stopgap continuing funding resolution before Monday, but the delay can make one a little nervous. Those of you who are really adept at PACER, the paperless system used by the Federal Courts, are probably already familiar with Justia, I find it to be a revelation. Did you know that you can find out exactly how many Social Security cases were filed in the Federal District Courts yesterday? You can. The number was 28. You can tell where the complaints were filed and the name of the plaintiff. You can then go use PACER (if you have an account) to view the complaint and discover the name of the attorney. You can do this for any time period since the beginning of 2004, although, apparently, Justia has trouble if the search would find more than about 50 cases. Also, there is no way to make it count the number of cases for you -- or at least I have not yet been able to figure out how to do this. The Norway Post reports that 10% of the working population of Norway is on "disability allowance." This is an increase of 3% from last year. The Pittsburgh City Paper is reporting on the Social Security difficulties faced by younger individuals afflicted by Parkinson's disease. One might think that the very public plight of Michael J. Fox would have helped eased the situation for other younger individuals suffering from Parkinson's, but here is a quote from one person: "I told [the young-onset Parkinson's support group] I was applying for disability, and they all kind of laughed and told me their horror stories ... How it can take years and you can still be denied." This week marks the final week of FY 2007. It is clear that the Congress will not send any of the twelve FY 2008 appropriations bills to the President for his signature/veto before FY 2008 starts on October 1. Thus, the Congress will have to pass a Continuing Resolution (CR) this week to keep the federal government operating until the FY 2008 appropriations process is completed. Most rumors have the first CR lasting until mid November with programs funded at the current (FY 2007) levels. The current level of funding means little or no new hiring -- of Administrative Law Judges or anybody else. Mid-November is not the outside on when the Social Security Administration would have a new budget. This impasse could be resolved by then or could drag on into the next calendar year. There is no serious dispute over the budget for the Social Security Administration, but serious disagreements about just about everything else. This document contains a correction to the final rules that were published in the Federal Register on September 5, 2007 (72 FR 50871). The final rules amended our regulations to reflect two provisions of the Balanced Budget Act of 1997 that affect the payment of benefits under title XVI of the Social Security Act (the Act). One of the provisions extended temporary institutionalization benefits to children receiving SSI benefits who enter private medical treatment facilities and who otherwise would be ineligible for temporary institutionalization benefits because of private insurance coverage. The other provision replaced obsolete terminology in the Act that referred to particular kinds of medical facilities and substituted a broader, more descriptive term. The Bush administration said Monday the only way to permanently fix Social Security is through some combination of benefit cuts and tax increases. That was one of the key findings in a new paper on Social Security released by the Treasury Department in an effort to achieve common ground on the politically explosive issue. "Social Security can be made permanently solvent only by reducing the present value of scheduled benefits and/or increasing the present value of scheduled tax increases," the paper said. The Treasury paper said that while other changes to the giant benefit program might be desirable "only these changes can restore solvency permanently." I do not understand why the Bush Administration says benefit cuts are necessary. My understanding is that simply removing the cap on earnings that are subject to the FICA tax takes care of 93% of the problem and does not affect most wage earners. Take a look at the "Social Security Game" put out by the American Academy of Actuaries and make your own choices. The Rhinoceros In The Room? Below is a small extract from a longer work from ERI, a company in the business of selling employment data, particularly what they regard as a replacement for the Dictionary of Occupational Titles (DOT) (Emphasis added). Each month the eDOT Skills Project [one of ERI's products] collapses DOT jobs no longer found in the economy into remaining eDOT data (so that historic data is not lost and we don’t inadvertently, as we have and corrected, eliminate a job like “chicken debeaker” which still exists in the American economy). It should come as no surprise that unskilled, sedentary jobs are disappearing. The joke among PAQ [part of ERI, apparently] analysts is that the only unskilled, sedentary job to remain in America is the “DOT Killer.” [I think they are referring to those they accuse of wanting to destroy the DOT.] But you can’t joke about your opposition. As opponents, the “study of specific work” has politicians desiring to be reelected, executive administrations wishing to hide unacceptable unemployment rates, a major user group – career planning, admittedly finding the O*NET a superior alternative, a judicial system where pain and emotion are appealing compared to fact (the latter being appealable), an SSA focused on “studying the problem,” vocational experts who believe labor economic data is an “art not a science,” and a legal system where attorneys are magnificently compensated under the status quo. If this makes little sense to you, let me try to give a little background. Social Security is denying tens of thousands of disability claims each year based upon the premise that there are many unskilled sedentary jobs in the economy. Social Security's evidence for the existence of these unskilled sedentary jobs is the DOT, which said that there were, but the DOT has not been updated in decades and is terribly out of date. ERI is saying that they have evidence that these unskilled sedentary jobs no longer exist. If they are right, tens of thousands of disability claimants are being denied improperly each year. ERI is saying that a lot of people have incentives to ignore this problem. 2,800 North Dakotans now caught up in "broken system"
(WASHINGTON, D.C.) --- U.S. Senator Byron Dorgan (D-ND) wants to know why 2,800 North Dakotans and hundreds of thousands of other Americans who have submitted disability claims under the Social Security Administration are being systematically denied, only to have them approved on appeal - after waiting nearly a year and a half. "This system is broken," Dorgan said Thursday. "How else can one explain that the appeal process results in nearly two thirds of the claims that were previously denied finally being approved? Moreover, the huge backlog of claims means that many with disabilities are forced to live in poverty while waiting for a fair resolution of their disability claim." Dorgan has asked the Inspector General's office to investigate what has caused these problems and to determine how it affects people. "This is unfair to a lot of working Americans who have paid premiums in the form of their social security payroll tax for a program that includes disability payments if they become disabled," Dorgan said. "However, it seems that someone has decided they are going to systematically deny those claims and force those people to wait lengthy periods of time before an appeal will be heard. We now learn that nearly two thirds of the claims that have been denied were subsequently approved on appeal. This suggests to me that a whole lot of folks who are suffering with disabilities are being mistreated by this system and I want it fixed." "Nationwide, there are more than three quarters of a million waiting in long backlogs to have their appeals decided. I don't know whether it is sheer incompetence or a deliberate decision to delay and deny benefits that people desperately need that have previously paid through the social security system, but I intend to find out." In a letter to the President, Dorgan is also asking for action to correct the situation. "The bottom line is that elderly Americans and other poor individuals with disabilities that prevent them earning a living and paying their bills deserve better," Dorgan wrote. "Social Security disability benefits keep millions of disabled Americans out of poverty. But these people who are unable to work and need immediate assistance to avoid financial collapse do not appear to be a priority for your Administration." A lot of things can be lost in the red tape of bureaucracy. What Kingman resident Deanene L. Greenwood didn't expect was her life. Greenwood, 50, came to the sudden realization roughly 10 months ago that her checks were bouncing. When she contacted her bank, they notified her that her checks from the Social Security Administration were no longer being deposited into her account. "My initial thought was they just transposed numbers," Greenwood said. "I really just thought it was a typing error." With a little detective work, otherwise known as repeated calls, Greenwood said a representative with the administration told her that she had never received benefits and wasn't in their system. Through all the calls, Greenwood said she didn't record or recall the names of the individuals she spoke with. After a few more calls, Greenwood said a representative with the administration told her that she was listed as deceased. Greenwood said in April 2005 she started receiving disability benefits from the administration. She added she was also receiving payment for her two juvenile children through benefits her deceased husband had obtained. Roughly 18 months ago, Greenwood applied for and received retirement benefits from the Social Security Administration. Greenwood added they made her choose between that and disability, so she chose the greater retirement check. She was unable to provide documentation of this. Greenwood said that she had packed up her paperwork, along with the rest of her belongings at her home in the 100 block of Chestnut Street because it is being foreclosed on. Without the checks, Greenwood said she had to tap into her other resources. "I've gone through all my savings," Greenwood said. "I've gone through the savings I had for my two children's education." Around three months ago, she ran out of funds. Utilities were turned off at the residence. Greenwood said she agreed to put her twin 16-year-old sons in voluntary hardship placement when Child Protective Services contacted her. During her time of need, Greenwood said that she has received support from the St. Vincent de Paul Society and the Salvation Army. Without transportation and tired of trying to make something happen over the phone, a friend took Greenwood to the administration's office in Prescott. Greenwood said three months ago she reapplied for disability and retirement payments. She added they told her it would take between two to three months before she received notification of her status. Social Security Administration Spokesperson Lowell Kepke said they never reported Greenwood deceased. He added they had never given her retirement benefits in the past. Kepke did say Greenwood was receiving checks for the children of her deceased husband. He added they stopped sending the checks when she no longer had custody of them. Kepke said the state of Arizona is currently processing her new claim for disability benefits. He added it is impossible to put a time line on how long it would take to process. "I'm not trying to get disability," Greenwood said when told of Kepke's comments. "I'm trying to get my retirement back." Greenwood said she applied in person for both and doesn't understand why her application for retirement benefits wasn't mentioned. "Once you retire, you're retired - supposedly," Greenwood said. I cannot tell exactly what happened here. Ms. Greenwood is almost certainly mistaken about some important details, but I strongly suspect that someone at Social Security did tell her at one point that she was listed as deceased -- probably not realizing that they were looking at her late husband's Social Security records. I also wonder whether she had been approved in the past for Disability Insurance Benefits and those benefits were, by mistake, not resumed when her Mother's Benefits ended when her children turned 16. More likely, she had been on SSI disability benefits which were ended by her receipt of Mother's Benefits and which would not have automatically restarted if she had been off them for 12 months or more. In any case, it takes staff at Social Security to sort out this sort of problem and Social Security has an acute current staffing shortage which makes it take forever to sort out this sort of problem. Also, by the way, the Social Security staffer who contradicted Ms. Greenwood to the newspaper reporter had no business talking with the newspaper about Ms. Greenwood's case, either to agree or disagree with her understanding of what had happened. This appears to me to have been a Privacy Act violation. It will analyze all potential solutions, and make legislative recommendations to Congress and the President on how to substantially improve the long-term fiscal balance in a report due December 9, 2008. To ensure the bipartisanship of the recommendations, at least three-quarters of the task force, or 12 members, must agree to them before the report can be submitted. Once Congress receives the recommendations as a legislative proposal, it must be fast-tracked to final consideration in both the Senate and House. Final passage of the bill requires a supermajority in each chamber -- three-fifths of the Senate and three-fifths of the House -- which is intended to ensure strong bipartisan support. It has been suggested to me that it would be a good idea if there were some way to publicly record the deaths of claimants who are awaiting a hearing before an Administrative Law Judge (ALJ) on a Social Security disability claim. There are far more of these deaths now than there used to be because of the enormous hearing backlogs. The deaths are a depressing fact of life for attorneys who represent Social Security claimants. Not a few of these deaths are suicides. Other deaths could have been prevented if the claimant could have had the Medicare or Medicaid that goes with Social Security disability benefits. There are some technical issues of how best to publicly record these deaths. At best, we will never be able to record anything like all of them. There are also confidentiality issues for attorneys if they list their late clients' names. Still, there ought to be some way of doing this so that the public could get some rough idea of the terrible effects of these backlogs. It would be nice if we could also have these show up on a map. If anyone has any thoughts about how we could do this, please share it with me either as a comment in response to this item in the blog or by e-mailing me. The problem, however, is that while banks may want to help out their customers, refusing to obey a garnishment order puts them at risk of state fines and penalties. As a result, Congress should consider "whether to undertake legislation that would provide financial institutions with protections from liability," Yakimov said. Even the Social Security Administration has largely thrown up its hands, Kelsey said. SSA recommends to beneficiaries that if a creditor tries to garnish their Social Security check, then the beneficiary should tell the creditor their benefits can't be garnished. "In other words, the exemption provision is to be treated as a defense to be raised by a beneficiary after a freeze or hold has been placed...rather than a bar against the imposition of the freeze or hold in the first place, Kelsey said. Baucus said that is just wrong. The Charlotte Observer recently ran an article about backlogs at Social Security's Charlotte, NC hearing office. The article implied that low productivity by local Administrative Law Judges (ALJs) was a major factor in the backlogs. This is a charge that I find to be ridiculous. It is inevitable that when you put any group of humans to work on any type of job that there will be a bell shaped curve of productivity. It is naive to think that the fault for this backlog lies with those ALJs who are on the lower end of this productivity curve, when clearly there are not enough of the ALJs and their support staff to get the job done. We cannot repeal the basic human characteristics which lead to the bell shaped curve of productivity. We must hire enough people to get the job done. ...As late as the 1990s, SSA had no significant disability case backlog. Today, the number of cases waiting to be heard exceeds 750,000. Yet the number of judges who handle these cases has remained static -- and the number of support staff has actually decreased. The Social Security Administration must release its Fiscal Year (FY) operating budget request for FY 2009 (which begins on October 1, 2008) in early 2008. Unlike all other agencies, Social Security is not only allowed, but required, to release its own budget request directly to Congress and the American people. The White House's Office of Management and Budget (OMB) makes its own budget recommendation for Social Security, but cannot censor the release of Social Securitys' own budget request. For FY 2008, the Social Security Administration, then headed by outgoing Commissioner Jo Annne Barnhart, asked for far more than what was in the OMB budget. As soon as he came on board, Michael Astrue, the current Commissioner of Social Security, disavowed his own agency's budget request, repeatedly telling a somewhat skeptical Congress that he was asking only for the lower OMB budget for his agency. There is some justification for Astrue's action. President Bush has threatened to veto any budget bill that is greater than the OMB proposed budget. There is enough Republican support for Bush to prevent a veto override. Thus, by asking only for the OMB budget, Astrue was trying to prevent a prolonged budget struggle, not that Astrue's action mattered, since it appears likely that there will be a prolonged struggle over the FY 2008 budget anyway, although the dispute has more to do with other agencies whose budgets are included in the same bill. Unlike the FY 2008 budget, President Bush's power over the FY 2009 budget is almost non-existent. He can veto anything that Congress passes for FY 2009, but Bush will be out of office long before the end of FY 2009. Congress can easily pass continuing funding resolutions to keep the government going until Bush leaves office and then pass a budget in early 2009 which Bush cannot influence. This leaves the question of what Michael Astrue will do about the FY 2009 budget. Will he be a loyal Republican operative and refuse to ask for a penny more than the OMB is willing to allow, thus proving that he lacks any independence from the White House, or does he ask for what he really thinks the agency needs, which we can be sure is much more than OMB will recommend? Astrue's budget recommendation makes far more difference with Bush a lame duck. An agency is unlikely to get more money than it asks for. I do not believe that I am jumping the gun by asking about the FY 2009 budget. My understanding is that agencies are required to provide OMB with their budget requests by mid-September of each year. OMB then gives each agency a "passback" showing what they will allow. Astrue must then decide either to go public with what his agency really needs or buckle under and be a good Republican operative and tell the world that all his agency needs is what OMB has allowed. See Budget Analyst for a much more complete description of the budget process, although Social Security has a unique situation not described there. The cards would act like a typical debit card with PIN and signature capacities. They would carry a Visa or MasterCard logo on the front and the bank's logo likely on the back. The payments would occur automatically each month, and recipients could access their funds through automated teller machines and point of sale terminals. 23.1 percent of prior SSRs have underpayments totaling $27.9 million that are not due to the recipients and need to be removed from the prior SSRs to avoid improper payments or improper offsets to recipients' overpayments. Authorities say a Berks County [PA] man illegally received nearly $40,000 in Social Security disability payments since 2001. Berks County detectives and Social Security Administration investigators have accused 46-year-old Heriberto Pagan, of Reading, of working at five different companies and three temporary employment agencies during that time, using stolen identities for which he obtained papers including state ID cards and a Social Security card. Even though Arthur Woolweaver Jr. contributed to Social Security his whole life, when he became terminally ill with metastatic lung cancer, he was unable to receive any disability benefits. Three months after the death of the Cuyahoga Falls man, U.S. Sen. Sherrod Brown, D-Ohio, has introduced a bill named for Woolweaver that aims to solve the problem encountered by the 58-year-old in his final months. The Arthur Woolweaver Jr. Social Security Improvements For the Terminally Ill Act would waive the five-month waiting period in the Social Security Disability program (SSD) [for those who are terminally ill], Brown said. "Social Security" Sues, But Who Is Social Security? The Alice Social Security Administration has filed a lawsuit against the Jim Wells County [Texas] Appraisal District, alleging the district set unreasonably high property valuations for the administration’s Alice facility. The lawsuit, which was made public Tuesday, was filed by the Alice Social Security Administration, L.L.C and Ronel, L.L.C., a Delaware company against the appraisal district. ... "The fair market value of the plaintiff’s property, as described above on Jan. 1, 2006 is $600,000," the lawsuit states. "The fair market value of the plaintiff’s property as described above on Jan. 1, 2007 was $620,000. The levying of a tax on plaintiff’s property based on a higher valuation is an unlawful levy, creates an illegal lien on plaintiff’s property, and is a cloud on plaintiff’s title to the property." The SSA and Ronel seek through the lawsuit that the court assess the value of the property at $600,000 for the 2006 calendar year and $620,000 for the 2007 calendar year, and that the district be required to pay all attorneys fees incurred while filing the suit. The SSA and Ronel are represented by attorney Christopher Smitherman of Bryan, Texas. Is this a private company named the Alice Social Security Administration, L.L.C.? If so, I think the Social Security Administration that is a federal agency might have something to say about the use of that name. Shrinkrap on the Social Security Perspectives blog associated with this blog is reporting that the Social Security Administration is hard at work on new psychiatric Listings. Shrinkrap should know since he is part of the group working on the new Listings. Any hints you can give us, Shrinkrap? By the way, Social Security Perspectives is supposed to be a group blog, but so far it is a group of one. Use the feedback button on the right to let me know if you want to join. The Prague Post reports that the United States and the Czech Republic have signed a Social Security treaty. The treaty does not come into effect until ratified by both countries. The results of a study commissioned by Social Security and done by Webility.md and SSDC on "Use of Functional/Vocational Expertise" is now available. Like almost every one of these studies done by the so-called "beltway bandits"it is stunningly vague and presents no workable ideas, much less any practical plan. What is particularly galling about this report is the involvement of SSDC, a company which is involved in representing disability claimants before the Social Security Administration, an obvious conflict of interest. Why would SSDC seek this contract? Why would Social Security give them a contract when they have an obvious conflict of interest? Make a gradual and orderly retreat from relying exclusively on the Dictionary of Occupational titles (DOT) and DOT-based methods and tools for addressing the questions of Step 5. Allow both internal and community-based mFV experts to use (and defend the use of) supplementary or alternative approaches to describing functional job requirements, determining feasible occupations, and estimating job prevalence when they believe that the DOT information is either obsolete, incomplete, not applicable, or missing. Require that such methods and tools be based on the most solid evidence practically available and widely accepted by organizations nationally-recognized in their field. For example, utilize tools currently in wide use by vocational experts such as The Occupational Assessor by Economics Research Institute (www.erieri.com) or Choices by Bridges (www.bridges.com). Fund the development of specialized tools that will (a) support comparisons of non-exertional functional limitations with job demands, and (b) more fully describe the nature and prevalence of sedentary and light occupations and actual jobs in today’s economy. If you are a Social Security official, how do you implement this nonsense? How do you make a "gradual and orderly" retreat from the DOT when you have nowhere else to go? Where are the other sources of information on the availability of sedentary and light occupations in the economy? The sources they suggest are completely unworkable and they know it. The only way to support the current method of disability determination at Social Security is to completely redo the DOT from scratch, which might cost more than a billion dollars and, even then, a new DOT would probably demonstrate the near complete disappearance of unskilled sedentary employment and a dramatic reduction in unskilled light employment in the United States, a result which would result in dramatically more claimants being approved for Social Security disability benefits. The authors of this study did not want to recommend this, nor did they want to recommend that Social Security go back to Congress or completely rethink disability determination, so they come up with this nonsense, collected their money and walked away. I can suggest only one reason why Social Security keeps wasting money on this sort of study. Social Security officials order these studies when they do not know what to do and just want to put off making a decision. I am pleased to announce that Bob Wilson, who for more than five years has been the Deputy Commissioner for Legislation and Congressional Affairs, has been selected for a position on the Appeals Council in the Office of Disability Adjudication and Review. I would like to thank Bob for his service and wish him continued success in ODAR. Margaret Hostetler, currently Deputy Commissioner for Policy, will become Deputy Commissioner for Legislation and Congressional Affairs. Margaret's many years working on key committees in both the House of Representatives and the Senate should serve her well in this position. Linda Maxfield will serve as Acting Deputy Commissioner for Policy. In the Atlanta Region, Amy Roberts has been appointed to the Senior Executive Service as the Assistant Regional Commissioner for Management and Operations Support. Amy has an extensive career in Operations starting as a Claims Representative and advancing through increasingly responsible positions in the Atlanta Regional Office. Amy is a graduate of the SES Candidate Development Program Class III. In the Office of Communications, Annie White, Associate Commissioner for Public Inquiries, retired August 31. Sheryll Ziporkin is now serving as the Acting Associate Commissioner for Public Inquiries. Please join me in wishing everyone the best in their new roles within the Agency. On Wednesday, thousands took to the streets in cities across the country against this pending crackdown that threatens the jobs of 8 million documented and undocumented workers. Milwaukee, Wisconsin had the largest turnout with an estimated 10,000 people observing a day of "No work, no school, no purchases." The Social Security Administration intends to issue on a sole-source basis a firm fixed priced purchase order to Acquire Media Corporation to renew an electronic subscription entitled: NewsEdge Insight/NewsEdge Live for online access to real-time news feeds from the following sources: AP Wash Report; AP in Brief; eMedia Political Transcripts; Federal Register; Reuters News Report and USA Today. Seriously, virtually all of this stuff is available free online. I hope Social Security is not paying much for this service. On August 9 Social Security adopted regulations allowing its senior attorneys to issue fully favorable decisions. I have not yet seen any staff instructions on the senior attorney program nor any sign that the program is being implemented anywhere. Creating the instructions should be a snap. Merely dust off the old instructions, make a few changes and you have what you need. There ought to be some training, but the process is not that difficult. Why should it take so long to get going? I can think of one possible explanation why things seem not to be moving. If attorney time is diverted to doing the senior attorney decisions, there will be less attorney time that can be devoted to writing decisions for Administrative Law Judges, creating a backlog there. In other words, the senior attorney program may not amount to much until more attorneys are hired and trained, because otherwise the agency is just borrowing from Peter to pay Paul and will get little if any boost in productivity. The Senate Finance Committee has scheduled a hearing for September 20 at 10:00 a.m. on the subject "Frozen Out: A Review of Bank Treatment of Social Security Benefits. Witnesses will be named later. "I'm not naive; I'm not going to tilt at windmills," he says, explaining why he isn't pushing for a new debate on massive, Bush-styled reform. Paulson described himself as a lonely soldier in the effort to battle for Social Security reform, one of the major issues he came to Washington to work on. He said that he has been encouraging ideas from all sides, but so far, "I've been playing solitaire." The numbers are in from the Office of Personnel Management for the number of employees at Social Security as of June 2007. Here is the number and how it compares with other dates. About a month ago I posted on this blog a notice about an opening at my law firm for an attorney to practice Social Security law, particularly to handle cases going to the Appeals Council and federal court. Given the number of Social Security employees who read this blog, it seems clear to me that a few hundred lawyers employed by the Social Security Administration read the help wanted ad or heard about it from someone who did, but not a single current Social Security employee has applied for the job. I can think of many reasons why an attorney employed by Social Security would not apply: not interested in moving, not interested in private practice, hoping to get an ALJ job, not interested in a job writing briefs, loves current job, etc. Of course, the Social Security Administration does not exist to train attorneys to work in private practice. The agency can take pride in retaining its skilled workforce. Still, it seems surprising that not a single current Social Security employee has applied, even at a time when some idiots are harshly and unfairly taunting Social Security attorneys by calling them "scriveners" or referring to them as "the dregs of the legal profession," largely because many have never made a court appearance. I do not agree in any way with this criticism. Social Security's attorneys have challenging jobs. There are many ways to be a lawyer and working for the Social Security Administration is one of them. I have hired former Social Security employees in the past and may do so in the future. There was a time in the late 1970s and early 1980s when there was a slow but steady stream of attorneys leaving Social Security for private practice. That is what I did in 1979. That stream has nearly dried up. Not only are Social Security's attorneys not applying for my job, but it seem that almost none of them are applying for other jobs or considering hanging out a shingle. I have worked for both state and federal government. I live in a state capitol where the dominant employer is state government. I have observed government employees closely for decades. My best answer for why almost no Social Security attorneys are looking at private practice is that government service is particularly attractive to people who value job stability over just about everything else. Private practice involves working for a small entity that cannot offer anything like the job stability of federal service and that makes private practice out of the question for most Social Security attorneys, even though law firms often offer higher salaries, better working conditions and a job that does involve representation of clients, which is the paradigm for the practice of law. Can anyone give a better explanation? Medical News Today is carrying an article written by a person who just received a favorable decision from a Social Security Administrative Law Judge. Is he happy? Not really. Of course, he made his situation worse by being so proud that he waited several years after becoming disabled before applying for benefits, but read it yourself. It is an all too common story. Inadequate services were most commonly found in low-income countries, but even in some high-income countries, people received inadequate services. For example, in the United States, only 18 percent received minimally adequate services—much lower than any other high-income country. The Bush administration spent at least $2.8 million traveling around the country promoting its plan to let many people divert a portion of their Social Security taxes into private retirement accounts, congressional investigators said Friday. Payments of fees to attorneys and others for representation of Social Security claimants climbed to over $100 million in August, according to figures released by Social Security. This was a 29% increase over July. I believe this is the first time that more than $100 million has been paid in one month. Here are the figures for the entire year of 2007 so far. The Insurance Journal is reporting that a federal judge in Chattanooga, TN has certified a new class action lawsuit against UNUM, the nation's largest Long Term Disability (LTD) carrier over an alleged scheme to deny of terminate benefits for thousands of disabled people. This is not the first class action on UNUM's LTD practices. The Social Security Administration says a federal judge’s ruling last week suspending a crackdown on employers who hire illegal immigrants could cause a major disruption in its processing of millions of routine retirement and disability claims. In a statement, Mr. Rust said the Social Security Administration had already delayed sending the letters to employers for several months this year as officials negotiated with immigration authorities over the new rules and the Senate debated an immigration bill, which failed in June. This is utter balderdash. Delaying sending out the letters does no harm to the Social Security Administration. Sending them out is going to cause a huge workload increase. I am appalled to see this sort of misrepresentation to a federal court. This is not the sort of thing that we would want to see from an "independent" Social Security Administration. This is a sign of an agency acting as if it reported directly to the White House. Technical Denials Soar -- Why? The Social Security Administration has issued its 2006 Annual Statistical Report on the Social Security Disability Insurance Programs. Oddly, the report seems to contain almost no information on backlogs, even though statistics on adjudication backlogs may be of more interest to more people than anything included in the report. Take a look at the outcomes chart. You can click on it to make it larger. It shows a recent dramatic increase in the number of technical denials. There were 104,344 technical denials in 1999 and 615,924 in 2004, according to an accompanying table. That would seem to call for a good explanation, but I cannot think of one other than that Social Security employees were using technical denials as a shortcut to getting their work done. Instead of helping a confused claimant, a Social Security employee would use that confusion as a pretext for denying the claim for failure to cooperate. Does anyone have a better explanation? The chart also shows that initial awards and Appeals Council awards went down significantly after George W. Bush became President (and Jo Anne Barnhart became Commissioner of Social Security). Snow's own life in many ways symbolizes the downside of the ownership society—and suggests how much a government role in health and retirement benefits is necessary. When Snow came to the White House after several years at the Fox News Channel, it was clear that he had relied entirely on others to save for his retirement. Snow conceded: "As a matter of fact, I was even too dopey to get in on a 401(k). So there is actually no Fox pension. The only media pension I have is through AFTRA [a union]." Even though his employer provided a 401(k) and would have matched contributions, and even though he was earning hundreds of thousands of dollars, Snow had not shown either the interest or financial capability to manage his own retirement benefits. I must have heard this at least a hundred times and the hair still stands up on the back of my neck ever time I hear this -- and I am not an opera fan. I regret to report that Administrative Law Judge (ALJ) James "Cleve" Miller of Greenville, SC has passed away. His funeral is tomorrow. You can see a brief obituary at the Berry Funeral Home website. Effective immediately, the "Quick Disability Determination" or QDD process has been made national, according to a Federal Register item. Previously, QDD was an experiment in the Boston region only. I have stated previously that I regard QDD as little more than a new name for something that has been around for decades. This may induce those unfamiliar with the program to think that Social Security has a new process to make disability decisions faster, but the truth is that this applies only to a small number of claims from the most seriously ill claimants, most of whom have terminal cancer. 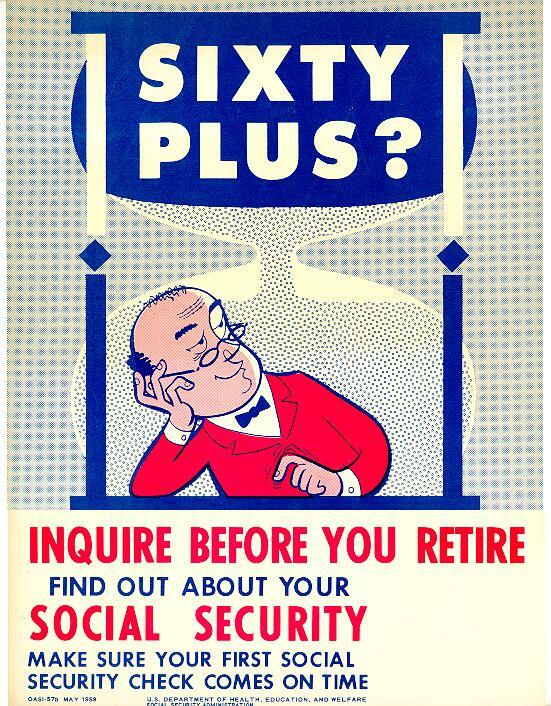 Social Security has always processed such claims expeditiously. Everything I have seen tells me that QDD is meaningless hype. "This is the most successful domestic program in the history of the United States," Clinton said to applause from seniors gathered in Washington to push their policy agenda. "When I'm president, privatization is off the table because it's not the answer to anything." He said the system is making unfair promises to younger generations, missing an opportunity to make itself solvent and failing to offer any meaningful support for older Americans. We [the Social Security Administration] are revising our regulations to reflect two provisions of the Balanced Budget Act of 1997 that affect the payment of benefits under title XVI of the Social Security Act (the Act). One of the provisions extended temporary institutionalization benefits to children receiving SSI benefits who enter private medical treatment facilities and who otherwise would be ineligible for temporary institutionalization benefits because of private insurance coverage. The other provision replaced obsolete terminology in the Act that referred to particular kinds of medical facilities and substituted a broader, more descriptive term. Online message boards can be an important source of news and views. Unfortunately, as anyone who has frequented them knows, their openness allows irresponsible people to drive away those who are responsible. These problems have seriously damaged the ALJ Improvement Board, dedicated to discussions of issues pertaining to Social Security's Administrative Law Judges (ALJs). There is now a new message board dedicated to the same topic, the ALJ Discussion Forum, which is doing much better. Unlike the old board, this new one requires registration to post, which may prevent the problems seen on the old board. They face a maximum prison term of five years for the Social Security offenses, 10 years for theft and a $250,000 fine if convicted. Pendleton is accused of using two different identities and Social Security numbers to obtain Social Security pensions worth $50,000. Brester's indictment alleges that he claimed disability payments of $158,000 from Social Security while working as a heavy-machine mechanic. Daano, aka Rufino Daano, is charged with allegedly claiming Social Security benefits intended for his former wife and stepchildren totaling $67,000. Von Jovi is charged with Social Security and passport fraud offenses related to the alleged use of multiple identities and Social Security numbers. Keola is charged with theft for allegedly collecting Social Security payments to his dead father totaling about $83,000. Q Regarding help from congressional representatives, about four years ago my son injured his back while working. He had to have major spine surgery. He was having great difficulty convincing the Social Security Administration of his complete inability to ever work again. Doctors and a hearing officer said he would never work again. Still, he was denied disability benefits. I helped him write letters to Sens. Dianne Feinstein and Barbara Boxer outlining the entire debacle and asking that someone intervene on his behalf. Feinstein assigned one of her top aides to delve into the problem. Within three weeks my son received notice from the Social Security office that he had been awarded disability coverage. We are absolutely certain that had Feinstein not intervened he would have been denied a third time. P.S. I have also written letters for other problems such as non-payment of rebates with the notation "cc: Action Line" and always get immediate attention. Thanks for having such a strong reputation that vendors and manufacturers hurry to resolve complaints in order to avoid having their names published in the newspaper. A Thanks, Gloria. From the mail I'm getting, it looks like the folks in congressional offices can really make things happen. So, if you have a problem with a federal agency, get in touch with your local representatives. You'll find their contacts information on the Web or in the phone book. I call this naivete because all that results from contacting a Congressman or Senator about a pending Social Security case is a meaningless exchange of form letters, with the Senator or Congressman getting all the credit if the claim happens to be approved. Funny, but the Congressional representatives never seem to get the blame for denials and delays. More than a dozen representatives of labor, church and immigrant-rights groups gathered Thursday outside the Social Security Administration office in Seattle, trying to dissuade its administrator from taking steps they said will lead to mass firings nationwide. The petitioners handed a request to SSA spokeswoman Joy Chang asking administrator Don Schoening to refrain from mailing so-called no-match letters next week. Chang agreed to consider a meeting addressing the group's concerns. I do not know who Don Schoening is. February 2, 2008 Minnesota Legal Services Coalition CLE, location? If you know of others I have not listed, please use the feedback button on the right side of the page to let me know.